All I really remember about the great 1953 film, The Wild One, starring Marlon Brando (photo), was that it was very loud with the sound of motorcycles. 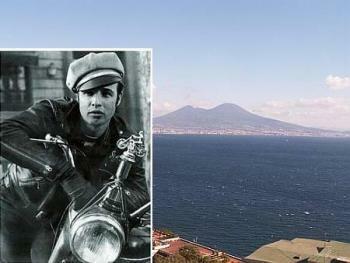 That may have had a certain quaint charm in the early 1950s, but not now and not in Naples. The other night, I was third or fourth in line in my car, waiting to turn left at the light change when a homegrown version of the Black Rebels Motorcycle Club went screaming by —about 15 punks on bikes, not one helmet among them, weaving in and out of traffic and making obscene gestures at all of us poor saps in cars as they sped right through the intersection and red-light. No doubt they were on their nefarious way to harass some clean-cut cafe waitress on her way home to Pop. They all made it through totally unscathed. These are the furboni (Big Clever Ones), those who always get away with everything, and I thought, "C'mon — just once. Maybe not under a train, but... some justice, some moral equivalent of a train." I have only seen that "just once"—well, just once, in Naples. I'm stopped in my little minimobile at a railway crossing. The red warning lights are flashing and the barrier has just come down in front of me; I am first in line on my side of the tracks. I resign myself to wasting another two or three minutes of the paltry few thousand remaining to me. I examine the barrier on my side. It is a good barrier; it is imposing, straight and true, a Thou-shalt-not-pass kind of barrier, if ever there was one. Casually I glance across the tracks and notice the other barrier. It is not straight. It has a big peaked bump in the middle; it looks like the universal symbol at camp grounds which means "You May Put Your Tent Here." At some time that thing played Guillotine opposite some poor car's Marie Antionette. This, in itself, makes me smile. This is not the sense of justice I mentioned a second ago; this is justice's evil step-sibling, which the Germans so delightfully call Schadenfreude—joy at the misfortune of others. Two young thugs on a motorcycle now roll up to that hunch-backed barrier across the way, having adroitly and with utter disdain for the laws of Nature, Nature's God, and the Italian traffic code, zigged and zagged their way around a dozen other vehicles to get to the front. (It wouldn't be so bad, except that they both have that perpetual "Don't you wish you were as cool as we are?" smirk frozen on their totally moronic ratty little punk faces.) They don't ask —rather, they tell— the keeper of the barrier that they are going through anyway, and he glumly glances down the tracks, hoping that the train isn't close enough to ruin his fatality-free safety record (at least for the current week). Now, on their side of the tracks they pass rather nicely under that hump. The driver lowers his head, which isn't too big, anyway, and he doesn't really have to tilt the bike too much. Moron number two just slumps down and hangs on. On my side, however, things aren't so easy. "My" barrier has no hump and is not about to let a couple of human snakes like this slither under, no questions asked. This becomes clear to the "furbone" driver, who now has to slide out of the saddle to support himself, his machine and passenger with one leg while he tilts his bike low enough to shimmy under. He is having difficulty and has put together a combination of stutter-stepping, shuffling and kick-boxing—like an alien auditioning for Dancing with the Stars. He is not amused and is visibly irritated at the fact that his audience —me included— is watching him lose his cool. In fact, his cool is about to turn to small puddles, since there is a train approaching. In the meantime, "furbone" number two, the passenger, in an attempt to help, actually stands up from the passenger seat as the bike lists low to the ground. Both his feet are on the ground (where his knuckles usually drag), and this, of course, takes some weight off the bike, enabling the driver to wriggle under. He does so. Then he straightens up in the saddle, gives a satisfied ego-vroooom! on the controls and roars off. Not until he turns his head —twenty yards down the road— to have a nice collective laugh with his friend at the expense of all of us still waiting for the train to pass, does he realize that his co-moron is still standing inside the barrier, knees still bent, arms outstretched, looking like a water-skier waiting to get up. The skier scurries under the barrier to get out of the way of the train. His ride turns around and comes back to get him, and they both have to put up with a chorus of hooting, honking and laughing, derision much more painful to them, I can well imagine, than being flattened by a million tons of metal. They had been caught being uncool. The train didn't get them. It wasn't real justice —but it was close enough.